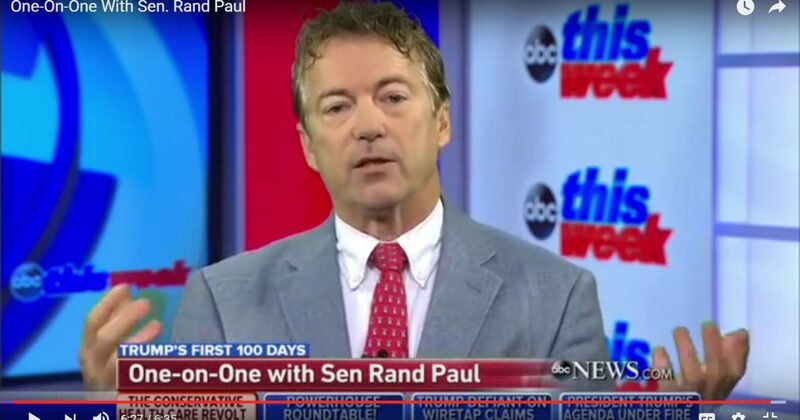 In an interview with George Stephanopoulos, Rand Paul declared that we know for certain that the Obama administration spied on then-candidate Trump’s campaign team. General Flynn, in particular, was certainly wiretapped. And if you would like to be naive enough to believe that Flynn was the only one, be my guest. It appears that the method used to spy on Trump’s campaign staff was to monitor his staff’s conversations and when something that could be used to implicate a staff member was found, design a legal route to justify it, in this case, claim that the surveillance was of a Russian who just happened to be speaking to General Flynn, then start screaming that Trump is a Russian agent in the hope that it would stick. So far, it has only stuck to garden variety morons like Stephanopoulos. Rand Paul: “I think that we know one thing for sure, that the Obama administration did spy on Flynn. Now, whether it was direct or indirect, somebody was reading and taking a transcript of his phone calls and then they released it. It is very, very important that whoever released that go to jail because you cannot have members of the intelligence community listening to the most private and highly classified information and then releasing that to The New York Times. There can only be a certain handful of people who did that. I would bring them all in, they would have to take lie detector tests, and I would say, including the political people because some political people knew about this as well, but we need to get to the bottom of who is releasing these highly classified conversations. Rand Paul: “Well, what happens is it’s a little different than that. We target foreigners all the time, but they talk to Americans. They talk to the president. They talk to the national security advisers. And they’re supposed to be masked. But there was something alarming the other day. General Hayden admitted that people all the way down to some of the lowest analysts can unmask who the American is. So, someone unmasked General Flynn and they’re a low-level analyst, we need to be looking at their computer and finding out if they unmasked that conversation and if they spoke with The New York Times, you have got to put those people in jail, because you cannot allow this to happen, or we will have presidents being blackmailed or national security advisers being blackmailed. The relevant discussion begins around the 4:10 mark.